Well I always like to be a bit different and I'm doing it again. I don't actually have an army list yet so suggestions for any unit in the WE army would be appreciated. Can you tell this in the very early stages in my head? But I like it at the moment. Any thoughts? The pic is way too blue than what it really is, it's the photography. Try a codex grey skin tone on a test model, and use progressive white hilights. Thats the same thing I'm doing check out the "Dark Asrai" thread. maybe we can have combined fluff as a bunch of exiled WE? You could add spikes to the models, that would make them look more malicious and nasty. Bring forth the Naggaroth Woodies! Naggaroth for the win. Like the idea Angry Beaver, although not sure about the colour scheme, maybe you could paint them purple like the DE? Ya.... hear ya in requards to the color scheme. It does'nt quite work. 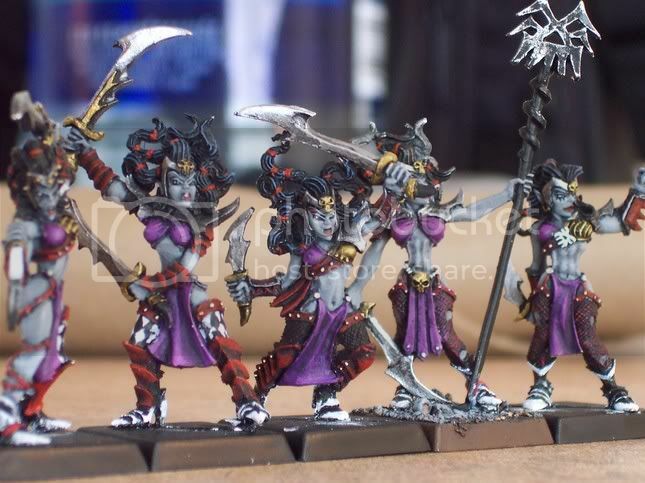 I've done the traditional Dark Elves in purple..... and they look good. I was trying to figure out how to do Wood elves with a grey skin tone to give them a darker feel. Since this is Blue Ander's thread, ... maybe we can get some more feedback as to what he want's to do with his Naggaroth Wood Elves. Those Witch Elves look really, really good. They remind me strongly of LionOfFlander´s DE army. Good work, I´d love to see more pictures of your Druchii. Wardancers would be witch elves and wardancer models mixed and matched. A few sword swaps would look good. Warhawk riders or great eagles could be warmaster manticores or saber tooths with fury wings. Mix spare warrior parts with glade riders for glade riders. Mix warriors and glade guard for Eternal Guard. Hope this helps, I think it's a good idea. Weekend has been a bit hectic but hopefully I can have a look at some DE models and get a few more ideas soon. Edit: Well I ve had a look at a few DE models and I'm thinking I could use assassins for waywatchers. I really like the beastmaster models but not sure what to use them for though. For mounts I'm not sure, I'm thinking either centigors or cold ones. I'm also liking the harpy models, I guess they could be warhawks but they're on smaller bases right? I like the shades too, maybe scouts? I'm not to sure yet. Witch elves will probably appear a lot as wardancers and warhawk riders, and wild riders maybe, but I'm thinking maybe deamonettes for the wild riders, again I'm not to sure yet. The thing thats kind of putting me off is all that metal, haven't really done much with metal models before and think it will make it hard to convert. Not to sure about colours yet, dark greys and blacks maybe, maybe avoid reds and purples cos I don't want them to look totally like DE, just more evil then your normal WE. also look at the Dark riders for more cloaky GRs. "Fear gives blood such an exquisite taste"
"For the land, my Lord, and the Lady"
I like the idea of the darker wood elfs. Your right Dooppie, I don't want them looking totally like DE. Maybe I'll take a few DE bodies and give them WE legs, heads, and arms. DE Shades converted to carry bows rather than crossbows would fit as they dont wear armour can can be easily painted and make good scouts or waywatchers. The old waywatchers wear nice heavy cloaks, they're much darker in tone than the current versions. Interestingly, with a little work shades make really nice wardancers with large potential for conversions and interesting paintjobs. Hadn't realised before that the Shades had no armour. They look to have a lot of movement in them, maybe they could work as warhawk riders. I've also had another idea, over the many centuries my WE have been in Naggaroth they have absorbed many fleeing DE. So what I'm thinking about doing is that any DE armour there is I could make it look old and rusty, maybe even drill a few holes inn it to make it look even older.